Love this cider! it's one my all time favourites!! Wish they sold it here in the UK! 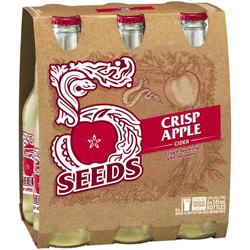 If your thinking of a real australian cider you have found the right one with 5 seeds has an amazing refreshing taste. Lovely cider, enjoyed many bottles while living in oz! Perfect for those rare sunny days when the bbq is out, quite sweet but very refreshing.